I am always hesitant to read books with dogs on the cover (because I've been hurt too many times before), but this one was a nice surprise. An adorable story about how a charismatic dog helped a little girl make friends and find her place in a new town. So cute, absolutely adorable. This book mixes humor and sadness, it feels very real. At first, I didn't really like the narrator/main character, but partway through, she grew on me. 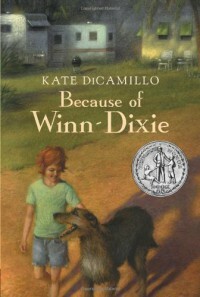 Probably because of Winn-Dixie. I guess he works his magic on us all. Well-written and entertaining, this is a surprisingly heartwarming book even though it deals with a lot of hard issues (loneliness, death, abandonment, fear). The book does use the r-word a few times within the dialogue. In general, there is a defense of the person called the r-word, but not against the word itself. It was published 18 years ago so you can't really fault it for that, but it is good to note for parents/teachers who have children reading this book. It's a good teaching moment that some people use the r-word, but that it's a pejorative word that should not be used. A very well-written book. I really enjoyed it.